Veterinary technicians are critical to the day-to-day function of veterinary practices, and play vital roles in preserving animal health and welfare. National Veterinary Technician Week, first celebrated in 1993, takes place in the third week of October each year, and provides an opportunity to recognize veterinary technicians’ contributions. Brookfield Zoo Veterinary Services team includes seven certified veterinary technicians with combined decades of experience. 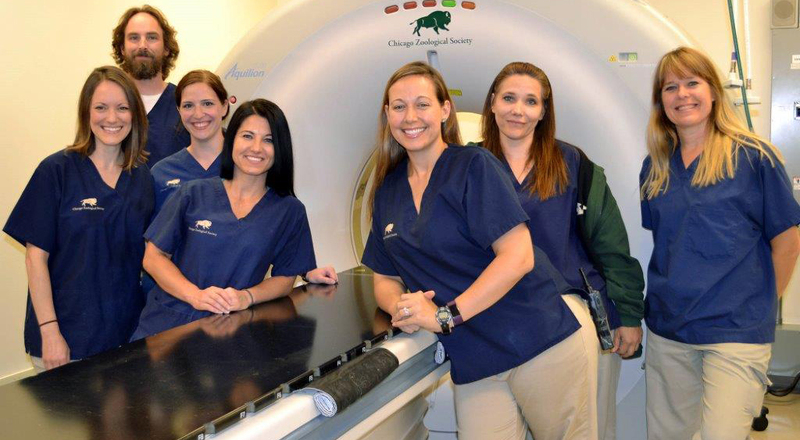 The vet techs at Brookfield Zoo are well versed in caring for multiple species and have received advanced training in quarantine care and the operation of many pieces of state of the art imaging equipment such as digital radiography, ultrasound, and computed tomography (CT). Veterinary technicians serve in multiple capacities and are highly functional, dedicated professionals that are integral to the success of our veterinary team at Brookfield Zoo. Although we value veterinary technicians every day of the year, we take this week to honor their commitment to compassionate, high-quality veterinary care for all animals. Please join us in acknowledging the many contributions made by our vet techs at Brookfield Zoo: John Pauley, Michelle Soszynski, Kate Sladek, Ashlee Webb, Michelle Eastridge, Mary Ann Duda, and Jennifer Klasen.